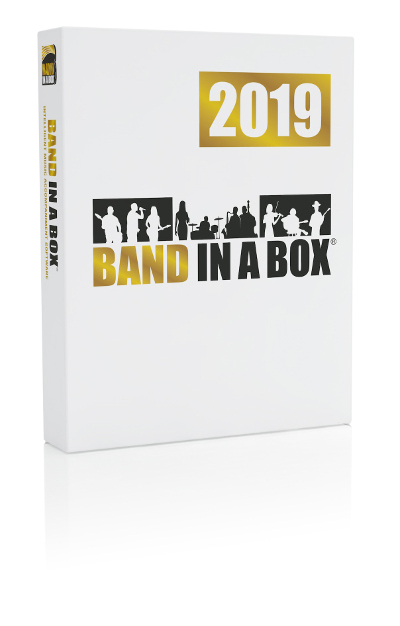 There are 64 exciting new features in Band-in-a-Box® 2019! First off is our brand-new 64-bit version of Band-in-a-Box®, which works well with the latest plugins and 64-bit OS features! We include both the 64-bit and 32-bit versions, so users of 32-bit Windows® OS can still run Band-in-a-Box® 2019. We’ve also made and include a 64-bit VST Plugin of Band-in-a-Box®, which you can use inside your favorite DAW (Cakewalk, Reaper, Pro Tools, etc.) to generate styles, RealTracks, RealDrums, Multi-Riffs, etc. We include a 64-bit GM MIDI synth VSTSynthFont64 with default GM soundfonts, allowing you to specify any GM soundfont - even larger ones over 2 GB! The completely redesigned SongPicker shows information for up to 50,000 songs and has useful filter and search features including search by chord progression and/or melodic phrase. We’ve added advanced filters to help you with searches for RealTracks, RealDrums, and MIDI SuperTracks. These include search by feel, time signature, tempo, RealCharts, and more. You can now control the loudness of each RealTrack in the medley. Notation enhancements include drum notation, drums RealCharts (transcriptions of some of the RealDrums), quick entry of forced accidentals, and more. We’ve added 300 more song titles to the Song Titles Browser. The Melodist now uses RealStyles to generate chords and melodies. Audio Harmonies are enhanced with BB-Harmony engine providing sophisticated harmonies with passing tones to your audio track. And much more! 202 new RealTracks for Band-in-a-Box® with great new Pop, Rock, Jazz, Blues, Funk, Country and World styles. 60 Jazz, Blues, Funk & Latin RealTracks (Sets 301-309): The Jazz, Blues, Funk & Latin collection this year contains an amazing assortment of legendary musicians. We’ve added more Drums and Percussion from the amazing Alex Acuna, well known as the drummer for Weather Report and many other seminal fusion groups. With this collection, along with the master guitarist Ramon Stagnaro, there are Brazilian Bossa & Samba styles (10) as well as many more Latin American styles (11) with RealTracks "firsts" such as the "Bajo Sexto," a Mexican stringed instrument. This set also features the requested "RumbaFlamenca" styles. We also have new Modern Funk RealTracks (10) from some of New York’s most exciting musicians. Guitarists Bob Lanzetti, Mark Lettieri, drummer Sput Searight, and percussionist Keita Ogawa are all part of some of the most exciting funk and world music projects coming out of New York and are now RealTracks artists. There are new "Fiery" Harmonica Soloists (5) from LD Miller, who won first runner up on the first season of "America’s Got Talent" with his amazing harmonica performances. We also have amazing new Blues Rhythm and Soloist Guitars (4) from the amazing Sol Philcox, as well as new Funky Acoustic Guitar (3) styles from Colin Linden and Joe Robinson. There are also new Djembe & other percussion styles (7), from Keita Ogawa, Tango styles (4), and Modern Jazz Waltz Drums (2). To top it off, we’ve added to our collection of Horn Section styles with some great, growly Blues Horns (4)! 68 Pop, Rock and World RealTracks (Sets 310-319): We have some amazing new pop, rock, and world styles with Band-in-a-Box 2019. The perennial favorite Brent Mason has recorded some beautiful new pop soloists on both Electric and Acoustic Guitar (8). We also have wonderfully spacey "Cinematic" Electric Guitar (4) from Darin Favorite, as well as beautiful new 12-string and 6-string "Campfire" Acoustic Folk styles (16), and Rock & Grunge Acoustic Guitar (4) from Quinn Bachand. In addition to this, we have Pop-Rock Pedal Steel (4) with a modern edge from the Nashville great Eddy Dunlap, "Southern Pop" Drums (4) from Land Richards, and a set of laid-back singer-songwriter guitar and piano (6). To round off the "world music" side of things, we’ve added new Klezmer (12) accordion, guitar, bass, and drum styles as well as "A Taste of Europe" set of accordion and guitar (4). These feature world champion accordionist Cory Pesaturo. We also have a set with upright bass playing basic pop styles, as well as pop accordion (8), which are all very useful in a wide variety of styles. Country, Americana & Celtic RealTracks (Sets 320-328): With Band-in-a-Box 2019, we’re introducing an amazing new RealTracks guitar artist, Johnny Hiland! Johnny is a Nashville legend known for his blistering fast "Chicken Pickin’" soloing style, and we have three soloist styles that we’re proud to present in our "Chicken Pickin’" (3) with Johnny Hiland! We’ve also expanded our collection of "Americana" RealTracks, with new keyboards (4) from a CMA winner Mike Rojas, resonator guitars (6) from Eddy Dunlap, nylon and electric guitars (6) from Brent Mason, acoustic bass (1) from Byron House, drums and percussion (6) from Bryan Owings, fiddles (2), mandolins (6), and another RealTracks first: 5-string fiddle (5) and mandola (5) from Andy Leftwich! We’ve added to our collection of Celtic styles with another RealTracks first: amazing Celtic cellos (9) by Natalie Haas, which includes options both for the common "Celtic Chopping" technique, as well as styles that utilize long, flowing lines. Also, on the Celtic front we have new 12-string, and nylon guitar styles (6) from Quinn Bachand, which utilize another RealTracks first: "DADGAD-Guitar tuning." There’s also a set of Celtic soloists (8), so you can have an improvised solo over your chord progression in the styles of a Celtic jig, reel, or hornpipe. And for the icing on the cake, we’ve added a new background vocal RealTracks style with Gospel "Mmms" Vocals (5), which includes options that utilize four doubled voices, or combinations of the individual voices!